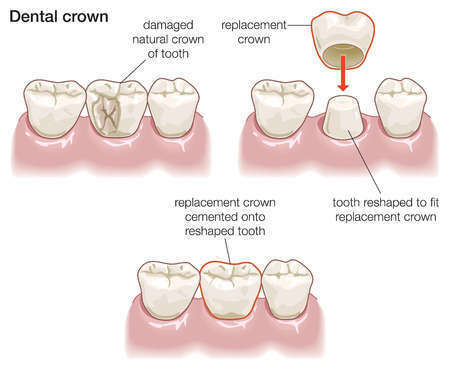 Dental crown is a treatment method used for damaged, decayed, crooked, broken teeth in the original forms. Crowns are usually applied to give the teeth a natural, properly aligned and more durable shape. The quality, durability and guarantee of the crowns are directly proportional to patient satisfaction. Both e.max, porcelain, zirconium and feldspathic supported crowns are used in our clinic. Our dentist will decide on the most accurate selection with you after the oral exam and face to face consultation. You need to stay one week in Turkey to complete the whole treatment process with follow-up checks safely. The dental crowns do not harm the tooth and, on the contrary, can prolong the life of the teeth. For aesthetic reasons, the dental crowns are applied completely in line with the wishes and expectations of the patient. Nowadays aesthetic zirconium supported dental crowns are often preferred. Zirconium is one of the most popular type of dental crowns in recent years. Zirconium should be preferred especially in the back groups,as the durability is higher. Zirconium teeth can be used for incisors but it will be the healthiest to decide on this situation with the dentist. Your dentist will inform you with more details about the zirconium dental crowns along with its pros and cons. Zirconium is tissue-friendly. This gives us the advantage to provide long-term predictions related to the usage period and comfort of using the dental porcelain. This is one of the most important reasons. They have a high level of fracture resistance and they are highly enduring and long-wearing porcelain. Zirconium has proved its durability to a dramatic extent with the measurements and tests performed, user groups and many processes. It is the porcelain which gives one of the most natural looks. Every individual has a different tooth structure, closure, lip and palate shape. Together with your dentist, you can decide which smiles would best suit you and what procedures should be applied for this smile aesthetics during the examination of your teeth, your palate, lips and the movement of surrounding tissues. One of the most important issues to remember is that each smile is unique and different from each other. But eliminating the defects makes a great contribution to getting a more impressive and beautiful smile. A minimum of 2 and maximum 4 sessions may be required for the preparation of dental crowns. First of all, teeth are prepared for bridge or crowns. The teeth are minimized by removing a layer of the outer surface and the size of the mouth is measured. The measurement taken is prepared as porcelain or zirconium quality in the laboratory and then is sent to the dentist for try-on if needed according to the condition of patient's mouth closure and tooth shape. If not needed, aesthetic porcelain part is prepared on this substructure and tried on in the mouth. Teeth treated with crowns may sometimes require root canal treatment. For patients experiencing extreme sensitivity or spontaneous toothache at night, root canal treatment may be the solution. However, no root canal treatment is required for every tooth with crown. For the crooked teeth, the decayed area is repaired and if necessary, the root canal treatment is performed, only then the crowns are done. Once the dental crowns have been placed, it is normal to experience some hot and cold sensitivity. This cold hot tooth sensitivity will disappear gradually over time. Dental bridges and dental crowns have a healthy use of 5 to 15 years. Especially zirconium dental crowns provide a longer usage duration. Because they have a very good fit with the cut tooth and the gum around it. Zirconium dental crowns, which have many positive biological features, are the most preferred aesthetic dental crowns in our day. To use your dental crowns in a healthier and more permanent way, you should pay attention to oral hygiene and care. The costs of dental crowns vary according to the number of teeth, deformation of teeth and cavities, the condition of oral health and other treatments to be applied. The costs of e.max, zirconia crowns, porcelain crowns will be determined according to the treatment plan. The most accurate information about the costs of dental crowns will be provided by your dentist after the first examination.